Bolivia is quickly gaining a reputation among tourists for its many cultural, exploration, and adventure activities. With the recent election of the country's first indigenous president, change is in the air, and a general sense of optimism prevails amongst the Bolivian people. Beyond any doubt, this South American country is a sure bet for vacationers, offering up countless unique opportunities. Here are ten things I'll bet you didn't know about Bolivia. 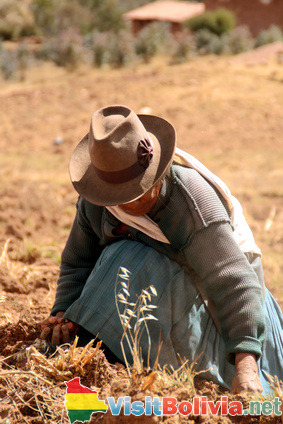 Bolivia's climate varies widely from one region to the next. You will have opportunities to visit snowy mountain ranges and steamy rain forests, all within the same country. Over half of the Bolivian population are indigenous Amerindians. The two largest groups are the Quechua and Aymara, representing 55% of the population. The many subgroups of these peoples, along with smaller native people groups, offers a wide variety of cultural experiences that can't be found anywhere else. While much of South America is known for political upheaval, Bolivia has enjoyed peaceful, democratic shifts in government since 1982. For those willing to get off the beaten path, Bolivia is home to many Precolumbian ruins, including many which have not been archaeologically excavated. Tarabusco, in south-central Bolivia, is home to the Pujllay Festival each March, featuring a one of a kind opportunity for tourists to interact with the indigenous culture of the Yampara people. In addition to religious ceremonies, visitors will love the open air markets, parades, traditional costumes, and plentiful supply of chicha, a local drink. Table football (foosball) is very popular in Bolivia. Adults and children alike can often be seen playing matches outside on street corners. Bolivia is home to Salar de Uyuni, the world's largest salt flat. Located in southwestern Bolivia, near the crest of the Andes Mountains, the flat stretches for over 10,000 square kilometers (over 4,000 square miles) and is almost perfectly flat. So flat, in fact, that it is considered the ideal sight to calibrate satellites. The vast expanse affords stunning views, particularly when the rays of the setting sun reflect off the white salt, creating the illusion of a painted landscape. During the early part of November, the flats at Salar de Uyuni are the breeding grounds for three species of pink flamingos, affording visitors a fantastic chance to view flocks of these gorgeous birds. Lake Titicaca, located on the border of Bolivia and Peru has the highest altitude of any commercially navigable lake in the world, at 3,812m above sea level. Containing over 40 natural islands, including many which are populated, it is also the largest lake in South America. Over 40 Uros, populated, artificial islands made of interwoven reeds, float on the surface of Lake Titicaca. These islands are man made, and designed to be movable. Access to the islands is afforded tourists via the city of Puno.